Apparently, Random Journal Day began several years ago when a group of avid journal keepers decided to share snippets from their scrivenings in a monthly meme post. Due to the busyness of life, however, the regular posts became semi-regular and then ultimately disappeared altogether. While I’ve regularly journaled since 2013, I was unaware of this like-minded tribe … until recently. Enter my new online friend, Enthusiastically, Dawn. I’m not quite sure how I met Dawn – either through a FaceBook repost or a YouTube suggested video – but suffice it to say, I instantly knew we had a lot in common. However, our personalities could not more different. Dawn is outgoing, creative and somewhat random. I am shy, reserved, and highly organized. But we both have a love of journaling, furry pets, and Jesus – which is enough to bind us together in a virtual friendship. As many of you know, I participated in the April blogging challenge last year where my theme was Journaling: A-Z. This resulted in the self-publication of my first book last May: Journaling Toward Wholeness – a 28 Day Plan to Develop a Journaling Practice. 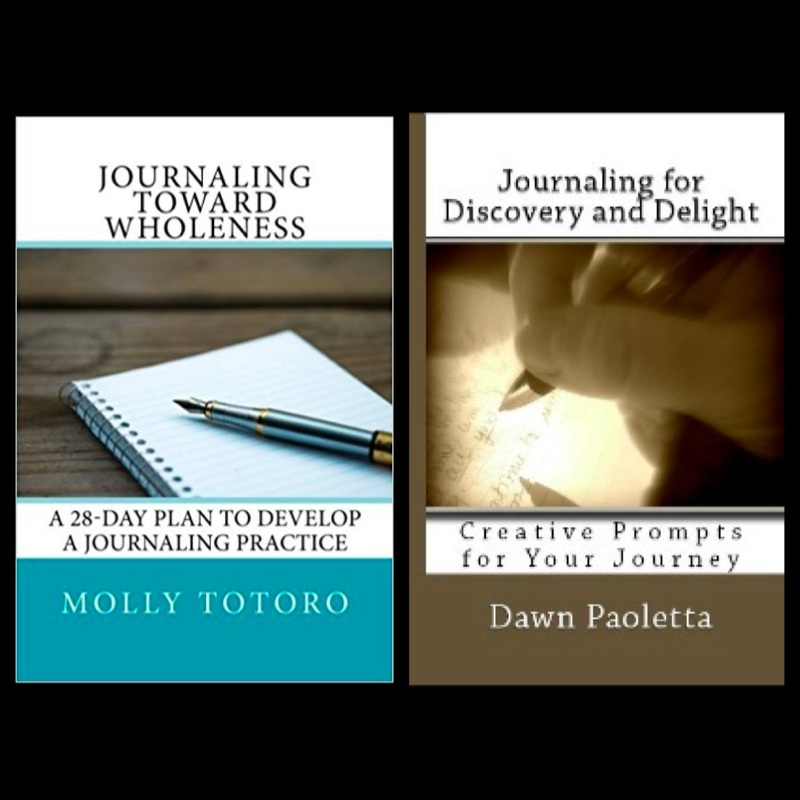 In October Dawn published her first book: Journaling for Delight – Creative Prompts for Your Journey. Aren’t the book covers uncannily similar?! One more confirmation we were destined to find one another. So… how does all this tie together? Dawn was a part of the original Random Journal Day (RJD) meme and she is responsible for organizing the reunion. She opened the celebration to anyone who loves to journal so I quickly registered. This is one party I did not want to miss (and that’s saying a lot for an introvert). Dawn graciously provided a list of writing prompts for us to answer or she said we could share as we see fit. I think I will start by answering a few of the questions and then if RJD becomes a regular celebration, I will share a bit more. 1. How many journals do you have in your archives? WOW… that is a great question! After a brief search throughout the house – and using basic estimation skills – I would say I have about 50 journals in my archives. When I first started this practice, I experimented with all sorts of journals: hardback and spiral bound – notebook size and pocket size – wide rule and college rule. At this point, I limit myself to those journals I know suit my style. I use composition notebooks for my memoir. I have a system for keeping track of stories I want to leave as a legacy, and these notebooks work well for that project. Bible Study where I keep four different Moleskine journals – one for Scripture, one for church notes, one for Bible study notes, and one for personal prayers. Writing Projects where I also keep four Moleskine journals – one for brainstorming new ideas, one for creative freewrites, one for my current MG fiction story, and one for Journaling ideas to follow-up my first book. For special vacations, I like to spoil myself with a new decorative notebook from May Designs. I like the customizable features and the size is large enough to document all aspects of the trip, yet small enough to fit in a backpack or purse. 2. Do you harvest your journals? How often? I occasionally review my journals for a specific detail I wish to recall, but I rarely “harvest” them. I would define harvest as reviewing the entries for the purpose of identifying a topic for further exploration – whether it be for a blog post, a story idea, or expansion for additional insight/reflection. While I haven’t harvested in the past, I plan to do so in the future. I love the idea of recycling old entries for new projects. 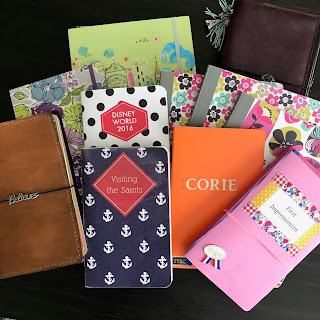 I’m not sure I will schedule a harvest time but instead, choose to mine old journals when I need inspiration – or perhaps when I wish to review the trajectory of life. 3. How has journaling brought delight into your life? Even though I only recently discovered journaling, I cannot imagine life without it. Journaling gives me a place to write down the frantic thoughts that continue to race through my head. Journaling silences the inner voices that try to derail me. 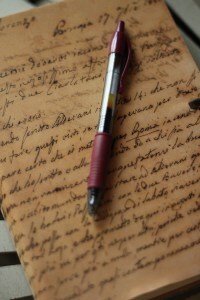 Journaling gives me space to breathe – to dream – to discover who God wants me to be. 4. In what ways has journaling enriched your: daily life, career, mental or physical health, spiritual life, and relationships? Gratitude: at one of the darkest points in my life, a time when I thought I had lost something quite important, I decided to start a gratitude journal. Every day I forced myself to think of five things to be thankful for. At the end of just two weeks, I felt noticeably better. The situation had not changed, but my attitude had. I never go a day without giving thanks. Quiet the Mind: I am an ISTJ on the Meyers Briggs scale – high Introvert and high Thinker. My brain never stops – and because I am shy and reserved – I rarely share with others. Consequently, it is easy for my thoughts to become stuck on the internal hamster wheel… circling round and round with no stop in sight. Journaling gives these thoughts a place to rest. And once they have found their way to the page, the discursiveness wane. Insight and/or Clarity: Oftentimes, however, there is another benefit to writing down these runaway thoughts. Perhaps it is the act of seeing them come to life on the page, or perhaps it is intentionally slowing down long enough to capture them … but often I finish the journaling session with the feeling of satisfaction and new insight. Sometimes it is an epiphany – sometimes it is gaining a new perspective – sometimes it is knowing the next step to take. And even if I have no answers at the end of the session, I do have a sense of peace. Of course, I have found many MANY other advantages to journaling, but perhaps I can share those another day. For now, I want to thank Dawn for showing me there are others out there who are as passionate about this topic as I am. I look forward to virtually connecting with you all throughout the year. I'm so glad you shared here about your journaling, Molly. I identify with so much that you say. I too came out of a time of emotional down-turn by journaling five gratitudes a day, befer I'd ever read about gratitude journals. My mind is going, going all the time, too, and journaling helps me so much to gain clarity… Etc. Thanks for sharing all this! Hi Molly, you have one of my all time favorite names, Molly! Isn't Dawn a delight? She and I are also different but I love her so much! So glad you shared your journal life. Very interesting. I love the title of your book – I must go check it out. I'm afraid most of the Mollys I know are members of the canine family 🙂 Yes, Dawn is an absolute delight – the title of her book is quite fitting. Hi Molly, I'm glad you joined in the reunion. Dawn does have a way of drawing us into community. I enjoyed reading about your journaling experiences and I very much identify with what you wrote about being an introvert and your thoughts getting "stuck on the hamster wheel." Journaling is definitely a practice that helps me sort out the mess in my head. Your book and Dawn's do look very similar. At first glance I thought they were companion books. I will have to check yours out.